Created by renowned architect Michael Graves, these award-winning tweezers have top beauty bloggers buzzing! Winning rave reviews for superior ergonomics, they’re comfortable to hold, and the broader design with rubberized finish makes them easy to grasp. Perfectly aligned, hand-filed slanted tips and wide, patented grip offer precision like you’ve never experienced. Providing increased strength and control, they clamp tightly and grip even the tiniest brow hairs for quick, easy tweezing. In professional grade stainless steel with soft-touch, rubberized, non-slip finish; 100% sanitizable. 3 1/2" L.
This is a really good pair of tweezers. They are sharp and really do get the tiny hairs. I'm getting use to the feel of them in my hands as the tweezers body is a little fatter than what I'm used to. All in all a good investment. Tweezers were sharp and performed as advertised on Day 1, after that they were dull, did not grip. A friend of mine has one of these and she loves it!!!! Good tweezers are hard to find. These look well-made and easy to handle. The angle is good. I'm disappointed you're not offering the pointed ones, too. You need both styles to do an adequate job. need a new tweezer, just wanted to try it. I am in need of a "good" pair of tweezers. They are so hard to find nowadays. Tweezerman's quality has gone drastically down over the years, but their prices have not! I hope these are what I've been looking for. 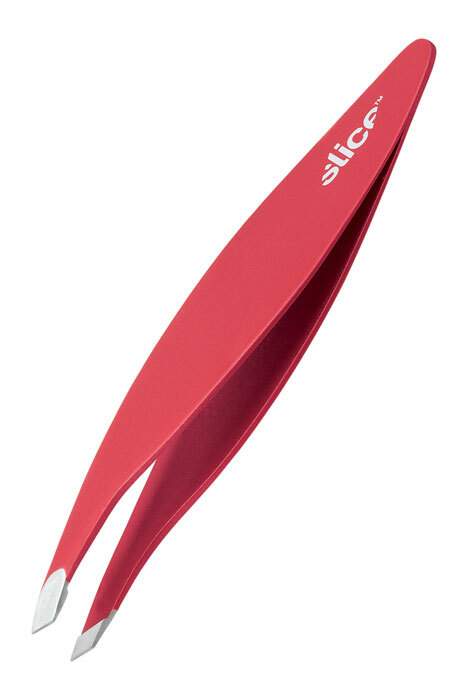 slanted tweezers help you get a good grip on tiny hair on the face.